With volume two (August 9, 1851) the journal changed its title to The Spirit Messenger and Harmonial Guide, and in October 1851 moved its offices to New York. In May 1852, the journal again resumed the title of Spirit Messenger and at the same time began another volume two, and on October 16, 1852, the journal adopted the title Spirit Messenger and Harmonial Advocate, restarting the numbering at volume 1. The journal ended with number 26, April 9, 1853. Originally, the journal attracted the talented group of Harmonialists who earlier had animated The Univercoelum and Spiritual Philosopher and had broken up over Andrew Jackson Davis’s affair with a married woman. The journal carried articles by Ambler, Frances H. (Fanny) Green, Hon. John W. Edmonds, Thomas Lake Harris, George Lippard ("The Poor Man"), Andrew Jackson Davis ("The Origin of the Devil"), J.K. Ingalls, and others. Ambler was a Universalist minister who was converted to spiritualism by the phenomena of the Fox Sisters (he acted as advance lecturer on their tours in early 1850), and returned to the pulpit in later years, disillusioned with spiritualism. Apollos Munn (1816-1851), Ambler's original co-editor, resigned in January 1851 and died later the same year — though he continued to further the cause by appearing at seances. Munn was a printer and newspaper publisher who was converted to spiritualism when a medium told him that the spirit of an unknown sister Lois wanted to communicate. He scoffed and left, only to learn later from his mother that his dead sister’s real name was Lois. His departure left Ambler to run the journal alone. He was the principal medium of the journal and increasingly the spirits spoke through him, and filled its pages with their communications. By May 1852, after a lapse in publication, Ambler had been replaced as editor by the "Spirits of the Sixth Circle" acting directly, and the pages per issue halved to save money. Initially the revived journal continued to devote itself almost exclusively to communications from the Spirits of the Sixth Circle (or, variously, from the Second Sphere) who communicated through Ambler and stressed that their principal purpose was the reform of renegade society. The journal soon lapsed again, and with the issue of August 13, 1852, Ambler again took editorial control in his own name, explaining that he had been overwhelmed by the spirits and assuring readers that the spirits had promised that the journal would last a year at least. 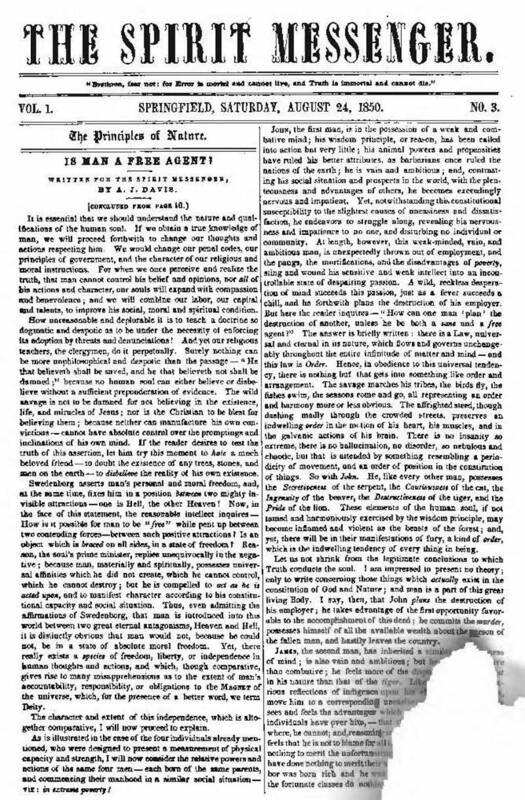 It did not, and ceased with the issue of October 1, 1852, only to be revived as a weekly at $2.00 a year advertised under the name Spirit Messenger and Harmonial Advocate, and in variants of this guise it lasted until April 1853. The rump of the journal was taken up in turn by The Journal of Progress, which was taken over by The Reformer, which was taken over by The Messenger of Light.